This delicious banana cake is the perfect way to use up over-ripe bananas, and makes a moreish teatime treat. Preheat the oven to 170C/150C Fan/Gas 3. Grease a 23cm/9in springform cake tin with butter. Add a tablespoon of flour to the tin and tip the tin this way and that until the base and sides are coated with flour. Shake out any excess flour. Blend the bananas in a food processor until roughly chopped, then add 75ml/2¾fl oz of the maple syrup and blend to a smooth paste. Pour in up to 50ml/2fl oz of milk and blend again to obtain a smoother consistency, if necessary. In a large bowl, beat together the butter and sugar until pale and fluffy. Add the eggs one at a time, beating after each addition until each egg is fully incorporated into the mixture. Add the baking powder, flour, banana purée and three-quarters of the pecan nuts to the bowl. Gently fold the mixture together until just combined. Spoon the cake mixture into the prepared tin. Bang the base of the tin carefully against the work surface a couple of times to settle the mixture, then sprinkle the remaining chopped pecan nuts over the top of the cake. Bake for 45-60 minutes, or until the top is golden-brown and a skewer inserted into the centre of the cake comes out clean. 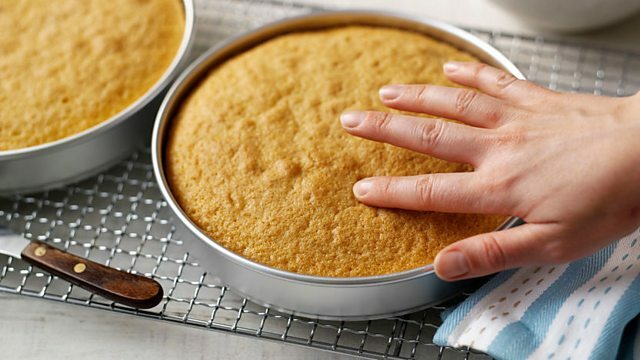 Set the cake aside to cool in the tin for 10 minutes, then turn out onto a wire rack and allow to cool completely. Meanwhile, bring the cream and remaining maple syrup to the boil in a saucepan. Continue to boil for 3-5 minutes, or until the mixture has thickened slightly, then set aside until completely cooled. 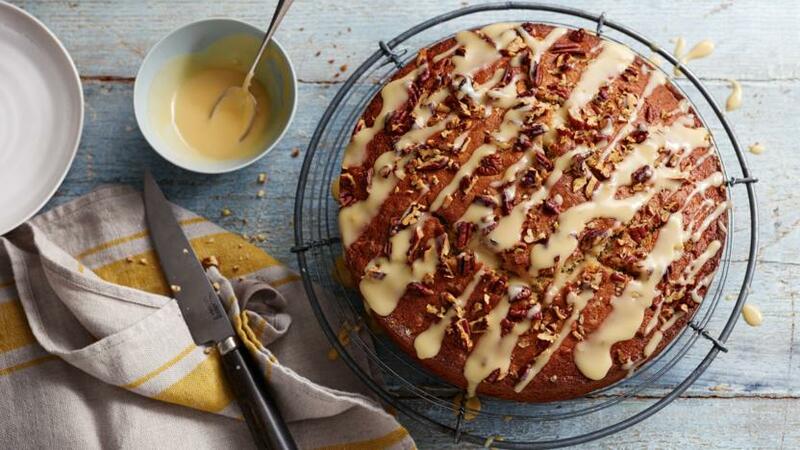 Before serving, spread the maple-syrup glaze over the top of the cake, allowing it to drizzle down the sides slightly. Set aside for 10 minutes, then cut into slices and serve.